The global edge analytics market comprises of hardware devices, software and professional services that helps in bringing automated analytical computation at the edge of the network. In general, edge analytics is relatively a new term which aims at collecting and analyzing data at the point where it is generated such as sensors, IoT gateways, network switches and other devices. This automated computation at the edge saves time, improves latency and reduces transmission cost of sending data to the cloud servers. The technology has gained momentum with the rising prevalence of IoT connected devices. Industries, such as manufacturing, transportation, and automobile are the most prominent participants of the IoT revolution and generate tremendous amount of operational data which can be difficult and expensive to manage. By processing data at the edge of a corporate network can empower companies to decide if the data is needed to be sent to the cloud or not. This is particularly useful in environments, such as oil rigs, aircraft, CCTV cameras, connected cars, remote manufacturing where there may not be sufficient time to transmit data to a centralized location and wait for the results. Also, edge analytics could prove to be a boon for the remotely located enterprises where there is a shortage of bandwidth to transmit operational data back and forth and hence, edge can efficiently provide computation and analytics capabilities in remote locations. An IoT gateway plays a very significant role in the deployment of edge analytics in any enterprise. This device acts as a bridge between connected devices and the centralised cloud server. Rising number of devices is consistently pushing the demand for these devices in solving data management issues. The gateway extracts all the sensor data and applies various rule-based algorithms and sends actionable commands to the connected devices in real time. Currently, edge analytics solutions are extensively being deployed in retail, manufacturing, energy, smart cities, transportation and logistics vertical segments. Some of the major use cases of edge analytics include: retail customer behaviour analysis, remote monitoring and maintenance for energy operations, fraud detection at financial locations (ATMs), and monitoring of manufacturing & logistics equipment. The market report is well designed to provide an all-inclusive field of vision about the market in terms of various factors influencing it such as, recent trends, technological advancements, and regulatory environment of the market. The scope of this report is centered upon conducting a detailed study of the solutions allied with the global edge analytics solutions market. The market has been segmented into ‘Mode of Deployment’, ‘Components’, ‘Application’, and ‘Region’. The report presents the reader with an opportunity to unlock comprehensive insights with respect to the market, and helps in forming well informed strategic decisions. The research uncovers some of the substantial parameters that must be taken into consideration before entering into the market. 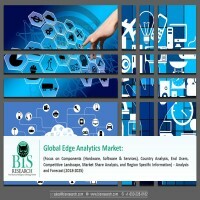 This research report aims at answering various aspects of the global edge analytics solutions market with the help of the key factors driving the market, threats that can possibly inhibit the overall growth of the market, and the current investment opportunities that are going to shape the future trajectory of the market expansion. The study considers the growth-share matrix model for a comprehensive study of the global edge analytics solutions market and assesses the factors governing the same. • What are the major market drivers, challenges and opportunities in the global edge analytics solutions market? • What was the market value of the leading segments and sub-segments of the global edge analytics solutions market in 2017? • How will each segment of the global edge analytics solutions market grow during the forecast period and what will be the revenue generated by each of the segments by the end of 2025? • What are the key application areas of the global edge analytics solutions market? How each of the application areas are employing edge computing? • Who are the key players in the global edge analytics solutions market and what are their contributions? • What is the scope for expansion by the key players of the global edge analytics solutions market in East and South-East Asia? The current edge analytics solutions market landscape consists of leading players from the public cloud segment such as Microsoft, IBM, Google, and Amazon AWS. There are also some of the leading networking companies such as Cisco and AT&T entering the market with edge computing capabilities, followed by a multitude of industrial automation companies such as GE Corporation, Schneider Electric and Siemens, among others. 1.1 What is an Edge? 1.2 Need of Edge Analytics? 1.3 Components of Edge Analytics? The Internet of Things (IoT) is bolstering the growth of many industries and is amplifying the value provided by the organizations to their customers. Smart cities, smart manufacturing, connected cars, and location-based intelligence are several ways through which IoT solutions are establishing a connected ecosystem. However, the success and evolution of this ecosystem depends upon the ability of IoT solutions to process data (generated by sensors and other devices) in real time at the network’s edge. Although, the emergence of cloud technologies has made it possible to develop such an ecosystem, there are challenges associated such as enhanced connectivity requirements and latency issues. Pushing huge amounts of data to the cloud for computation and awaiting analytical results may tremendously increase data transmission costs and simultaneously damage valuable milliseconds required for instantaneous feedback thus damaging real time responsiveness. Billions of devices are generating data with tenacity and making sense this big data will require huge investments in the expansion of computational resources such as analytics, storage and networking software in conjunction with computing platforms. Also, the IoT implementation requires skilled staff complex integration of different devices from different manufacturers having their own set of standards. Hence, organisations utilising traditional approaches to data analytics will need to heavily invest in the expansion of IT resources to leverage the full potential of IoT. Edge computing or Edge analytics, comes as a solution to help organizations overcome the infrastructure limitations. The technology is an evolution of cloud computing/analytics and an industrial manoeuvre to go one step ahead of democratising data analysis capabilities. It allows data processing right at the point where it is generated (for example: sensors, gateways etc.). Hence, instead of sending data to the cloud for processing and waiting for the analytical results, edge computing pushes the computation part to the edge of a network thus saving on response time as well as data transmission costs. The global edge analytics market was estimated to be $2.14 billion in 2017, and is expected to reach $13.44 billion by the end of 2025, registering a CAGR of 22.2% during the forecast period, 2018-2025. The expected double-digit growth can be attributed to the rapid proliferation in the number of connected devices and the continuous explosion of data generated by these devices. According to Cisco, a global networking company, there will be nearly 20 billion connected devices by the end of 2020, generating zettabytes of data. An average internet user is expected to generate 1.5 GB of data every day and the video traffic will also reach nearly a petabyte every day. However, there are various factors impeding the market growth and serve as challenges for the stakeholders, such as lack of standardization of network protocols, newly introduced data privacy regulations, integration of devices and identification of edge nodes. Despite the challenges, the edge analytics ecosystem provides the stakeholders with enormous opportunities. The rising amount of capital investments into the IoT ecosystem is a key determinant of growth in the edge analytics market and will further proliferate in the upcoming years. Local governments in countries such as Australia, the U.S., India, South Korea are heavily focussed on improving the operational efficiencies of their businesses and expansion in the organizational infrastructure.